The expected earthquake of magnitude mid 6R has finally arrived a day after the September Equinox, as we have posted in this blog. A list of suspect countries was also posted including Mexico and with coordinates. If you are registered reader you would have received them. This new earthquake sent residents streaming into the streets of Mexico City early Saturday, creating a fresh wave of alarm in a country still reeling from two powerful earthquakes over the past three weeks. The U.S. Geological Survey said the new temblor, which hit just before 8 a.m. local time with a magnitude of 6.1, was centered about 325 miles southeast of Mexico City in the state of Oaxaca, the region that took the brunt of the earlier magnitude 8.1 quake on Sept. 7. There were no immediate reports of major new damage or casualties in the Mexican capital, but in southern Oaxaca state, authorities said the strong aftershock caused new damage to homes and other structures already weakened by the Sept. 7 temblor. The 7.1 magnitude earthquake that struck central Mexico on Tuesday left nearly 300 dead and multitudes homeless, while damaging thousands of buildings in Mexico City and neighboring states. The earlier Sept. 7 quake, an 8.1 temblor centered off the shore of southern Mexico, killed nearly 100, mostly in Oaxaca and neighboring Chiapas state. Saturday’s temblor was likely an aftershock of the Sept. 7 quake, officials said. Authorities have registered more than 4,000 aftershocks from the Sept. 7 quake, but Saturday’s appeared to be the strongest. Quake alarms sounded throughout Mexico City on Saturday, and spooked residents dashed from homes and hotels. Electrical cables shook, and some buildings swayed. But most of the damage appeared to be centered closer to the quake, in the state of Oaxaca. Homes tottering from the Sept. 7 earthquake showed new cracks and in some cases collapsed in the city of Juchitan, the principal municipality on the Isthmus of Tehuantepec. Thousands of people who had to evacuate their homes there on Sept. 7 have been living under plastic tarps. Outside Juchitan, in the hard-hit town of Asuncion Ixtaltepec where 80% of residences were rendered uninhabitable on Sept. 7, some homes fell or showed new fissures. A bridge that had been damaged by the earlier quake was split in half and teetering on the verge of collapse following Saturday’s aftershock. Damage was also reported at a nearby military airbase that has been a central point for deliveries of food and other aid to Oaxaca. A hospital was evacuated in the port city of Salina Cruz in Oaxaca state. Authorities in the city of Oaxaca, the capital of Oaxaca state, reported only minor damage, including cracks on the bell tower of a colonial era church. In Mexico City, officials temporarily suspended rescue operations that have been ongoing since Tuesday’s quake until specialists have had a chance to evaluate any new risks. Initial reports indicated no new major damage in the capital, but many remain on edge since Tuesday’s devastating quake. 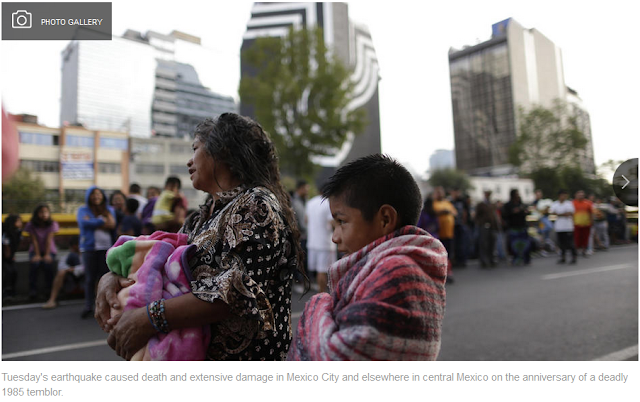 Saturday’s quake was felt lightly in the Condesa neighborhood, parts of which have a near-abandoned feel since thousands have evacuated from shaky homes. Some cafes and restaurants reopened Saturday, only to have panicked diners rush out the doors. Guadalupe Guarrdarama found herself reliving Tuesday's nightmare. She went out in the street crying, wondering if a building near her home that has been on the verge of collapse would finally fall. Guarrdarama works in a restaurant in the Mercado Medellin in the Roma neighborhood, selling hearty fare. After the initial quake Tuesday she had found herself struggling to breathe as others tried to calm her down. She's felt a heavy weight sitting on her chest ever since and has begun to wonder if she needs to speak to a psychologist. "I feel anxious, I don't feel safe," she said. "I feel anguished, afraid," said Angelica Salas, who was at home in the Roma neighborhood when the aftershock occurred. "I thought the house would fall last time, so you think the same thing." Emergency workers have been combing through the ruins of at least eight collapsed buildings in the capital seeking possible survivors. They must sift through fragile piles of debris that can pose a danger of collapsing anew. At least 30 people are believed to be missing in the rubble, Mexico City Mayor Miguel Angel Mancera told Mexican television. He and other officials have vowed to continue rescue work until everyone is accounted for, even as chances of survival dim as time goes by. About 3,000 structures in Mexico City suffered damage, and close to 40 buildings collapsed in Tuesday’s quake, authorities have said. Reports here indicated that one woman walking on a street in Mexico City collapsed and died of a heart attack as the new earthquake struck on Saturday. Bellini, the USGS scientist, said Saturday’s aftershock occurred at the northern edge of a field of aftershocks that have occurred since the Sept. 7 quake. “This one is shallower, in the upper part of the crust, but in the northern edge of the aftershock field after the 8,” Bellini said. The Sept. 7 earthquake was so large that the area of rock underneath the earth that moved was about 2,400 square miles long, or roughly half the size of Los Angeles County. There have been more than 100 aftershocks greater than magnitude 4.5.